A few more Shorpy photographs of people walking, these focused a bit more on male style. I do tend to notice men's dress, and here are a couple of good examples. Saratoga Springs is a resort town, known for its horse racing. 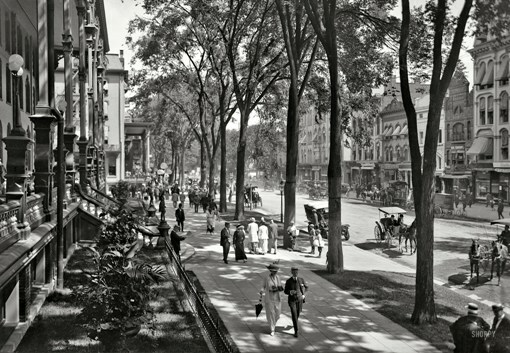 Here is everyone strolling in the shade of the elms, in 1915. This couple is quite elegant, but I think the male far outshines his mate. Everything about him is sharp. Meanwhile, right behind them: newsies! They really did dress like that. The more sophisticated older one is leaning casually against a tree, leg up, while the younger ones try to impress him with their street smarts. Finally, the heart of purposeful walking, New York City. 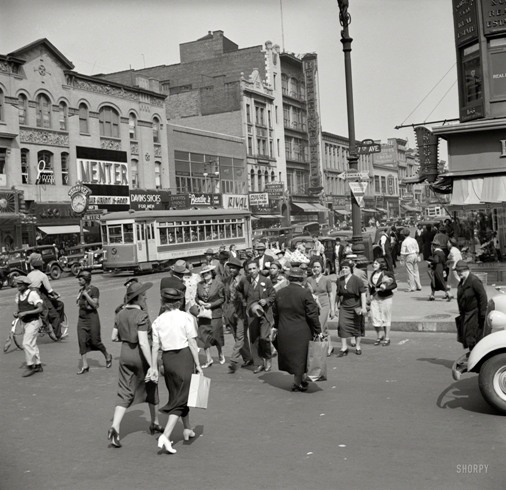 Here is a picture of the intersection of Seventh Avenue and West 125th, in 1938. Again, a lot of people, but I love this other gracious gentleman. Both he and the boulevardier in Saratoga Springs show that it's not just the clothes, but the way that you wear them. And, really, a hat helps, even though that is no longer permissible, and just makes you look like you're losing your hair. Where is she going tonight? But I also always like this cheerful lady right behind him. I wish I knew her. I wish I knew them all, and it is a bit chilling, sometimes, to realize that they are all long dead. Do you look at pictures of the past? What kind of thing do you look for when you do? I also look at machinery, architecture, and trains.